We skipped spring around Tallahassee and seemed to go right into summer. The weather forecast assures me we’ll be reverting back to more seasonal weather come tomorrow but due to this heat wave, cooking has not been high on my list. In trying to ease myself back into my usual schedule, I choose a quick and easy recipe that’s a healthy take on an old favorite. This Mexican Mac and Cheese recipe is quick and easy to make. However, it’s really more of a side dish than a main entree. I’ve been pairing it with side salads and small portions of chicken to feel like I ate a good meal for dinner. It is also a Weight Watchers recipe I found online so it’s on the healthier side of things – bonus! When melted, stir in the salsa and serve! 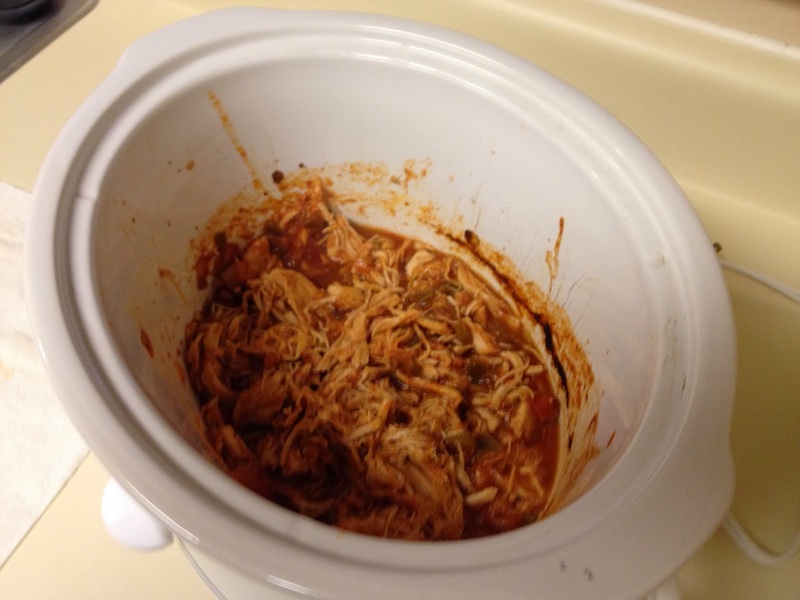 However, with the temperature falling to less hot and humid conditions, I was able to pull out my Crock Pot and try one of the many slow cooker recipes I’ve been stockpiling. I wanted to also pull it out while I would be home the entire time as it would be my first time using it with a very curious cat in the apartment. After she thoroughly investigated this new appliance on her side of the kitchen counters, and I think may have slightly burned the tip of her nose on it, it seemed to be uninteresting to her so success! I think it will be fine to leave it on for a work day if I want to do so and not come home to a monumental mess. So, which recipe to start with? It wasn’t quite stew weather yet and I wasn’t quite ready to make a batch of Aunt Marcia’s spaghetti sauce for the season. So, what to try? A quick search through Evernote where I hoard recipes found me this simple, easy to put together recipe for chicken tacos. I however don’t have a source. I have a vague recollection that one of my friends pinned this and I saw the post on Facebook. I actually used less chicken than the recipe called for and the batch still lasted me from Sunday to Thursday. I changed it up over the week, using the chicken for traditional tacos, chicken taco salads and mixing it with rice. For the last of the batch, I covered tortilla chips with it and cheese and made some fantastic chicken nachos. It may not look like much but it was tasty! 3) Shred the chicken with forks before serving. Somewhere along the way, I cut a short, easy looking recipe from a newspaper. I can’t for the life of me remember which one or where I might have been living when I did so. I’ve narrowed it down to either my grad school days or since I moved out here but that’s the best I can do. 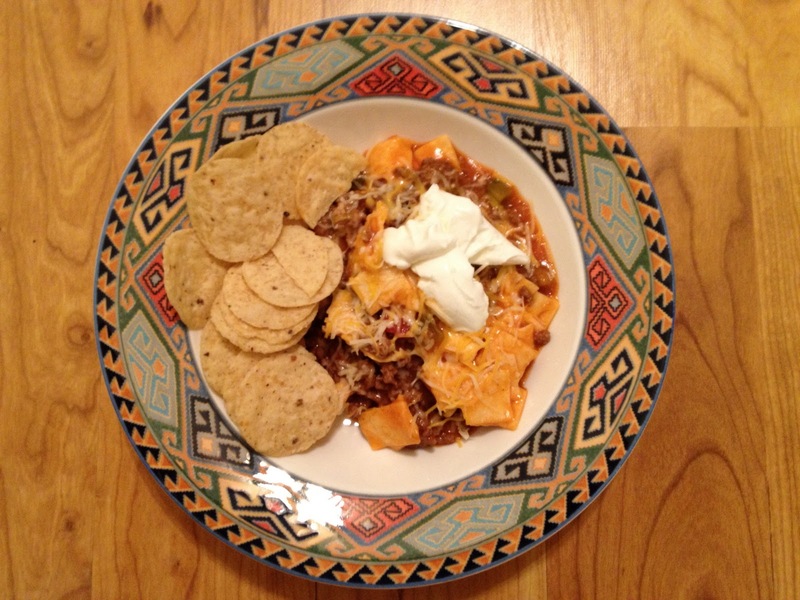 This Beef Taco Skillet used tomato soup for its base and I am a big fan of using Campbells for a starter – a recipe always seems fool-proof to me then. This recipe is definitely one of the easiest I’ve ever put together and it cooked up quickly and easily. But then, what I ended up I wasn’t quite sure what to do with. The skillet gives you a concoction of beef and tortillas cooked with salsa and tomato soup. It isn’t quite thick enough to be a stew and not thick enough to be a soup. It’s somewhere in the middle. I wasn’t exactly sure how to serve it. I think for the leftovers I’ll make rice to go with the dish, but for tonight I made do with tortilla chips and sour cream. I liked this dish but the taste of tomato soup sort of overwhelms it. I also think if I were to make this again I would add a dash of taco seasoning to give a better kick to it. As it is, this is a very mild, bordering on bland dish but filling. I had only a small helping myself and I’m stuffed. I also, unlike what the recipe called for, didn’t put cheese over the entire finished product, only my portion of it. As it will be eaten over the week, I figured I would prefer adding fresh cheese to each serving rather than putting it all on at once. Honestly, I have a better Mexican skillet recipe in a cookbook I prefer to this one so it’s one that is not getting a permanent place in my recipe box but I’m glad I tried it out. For a busy night when you aren’t sure what to make and you know you have a pound of hamburger in the freezer, I could see this becoming an easy, go-to dish. 2) Stir in soup, salsa, water and tortillas. 4) Stir and serve; top each serving with cheese.